Do you like history and ancient times? The charm of antique buildings and sights fascinates you? You are curious about the way things were long time before us? 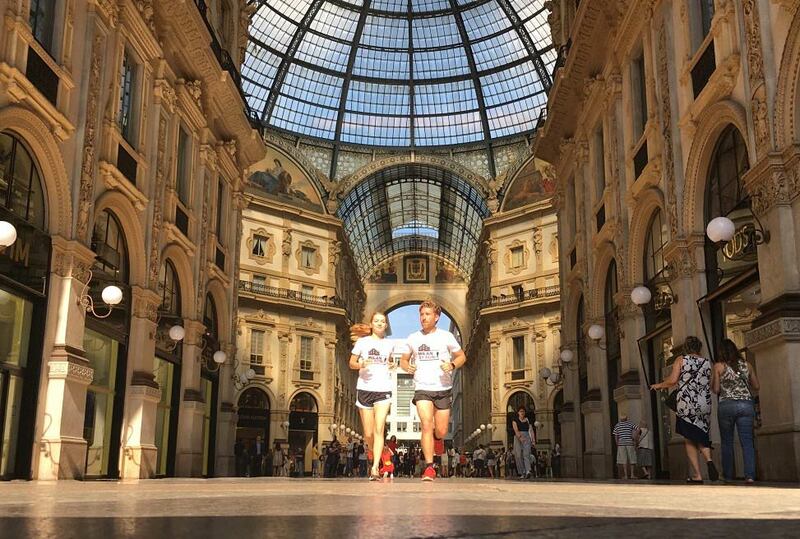 You will absolutely enjoy Historic Milan running tour. ● Ancient basilicas Basilica di San Lorenzo and Basilica di Sant’Eustorgio built in the times of bloodshed between pagans and first Christians. ● Remains of Roman and Medieval architecture that still carry all the beauty of bygone epochs known as Colonne di San Lorenzo. ● Gorgeous castle Castello Sforzesco that was ruined during the wars and rebuilt in all its glory in the last century. ● Canals Navigli constructed by the genius of Italian Renaissance – Leonardo da Vinci. Learn the most fascinating parts of their story and curious facts. Run through centuries of Milan’s life in 1 hour. You will run through centuries of Milan’s life in 1 hour and yoir guide will take you back to your hotel. DEPARTURE/RETURN LOCATION *Hotel/Apartment pick-up. if your accommodation is not located in central Milan (i.e. Quadrilatero della Moda) another convenient meeting point will be communicated. Stops: the running tour considers stops along the course to rest and to listen about Milan from your guide. Feel free to ask for a stop at any point of the running tour. Course: to ensure you obtain the best running tour experience, the pick-up/drop-off points are set at your hotel/apartment. Running guides customize the route according to the location and sights to be visited, therefore places you visit might be different from those mentioned in the description above. In case your accommodation is distant from the sights to be visited, pick-up/drop-off points can be arranged in a different location. The running tours are led exclusively in external areas and it is not planned any entrance/access to museums, churches, galleries and similar. Meeting point: hotel/apartment pick-up. If your accommodation is not located in central Milan (Quadrilatero della Moda – Via Montenapoleone Fashion district) another convenient meeting point will be set.